Due to oversubscription of the last workshop we are pleased to invite those unable to attend last time to book this class. 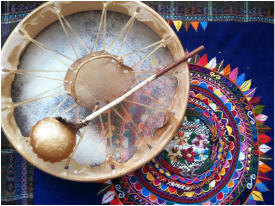 What is Shamanism plus where and when did it start? Who or what is a Shaman? What is a ‘Sacred Space’ and how do you create one? What is a ‘Shamanic Journey’ and how to experience one? How is Shamanism linked to world religions including the Druids? What is a ‘Medicine Wheel’ and how to create your own ‘Medicine Wheel cards’? Learn about this and much more.